$21.052 million on 3012 screens. Back when I reviewed 2010’s Afterlife, I marveled at Resident Evil’s persistence. 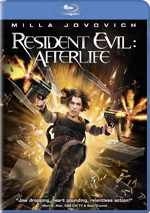 With a take of $60 million, Afterlife - the fourth flick in the series – offered Resident Evil’s highest gross to date. That’s pretty lackluster under any circumstances, much less in terms of a franchise’s biggest hit. 2012’s Resident Evil: Retribution created one decline from its predecessors. 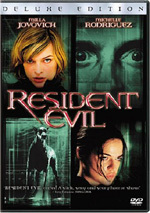 Its $42 million gross isn’t horribly out of line with what the other flicks did, but it came with a $60 million budget and became the first Resident Evil that failed to make back its cost at the US box office. With a total worldwide gross of $221 million, though, I suspect that we’ll continue to get Evil flicks as long as the studio wants to churn them out. As in prior films, a deadly virus created by the Umbrella Corporation zips around the world and turns folks into zombies. 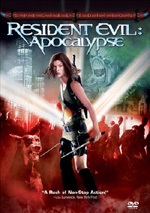 Also as in the past, agent Alice (Milla Jovovich) works to halt these plans and save humanity. Formerly imbued with super powers, Alice now lacks those, and that factor affects her ability to fight. However, she’s still a badass as she leads other human survivors against the zombies and the actions of Umbrella. In the midst of battle, Alice gets thrown into the sea – and when she wakes up, she finds herself in a suburban setting with husband Todd (Oded Fehr) and daughter Becky (Aryana Engineer). They become subjected to a zombie onslaught, and Alice doesn’t understand any of what happens. When a mutated Todd attacks Alice, we then find her in a holding cell under interrogation from former ally Jill Valentine (Sienna Guillory). Confused yet? Keep seated, as the flick continues down an ever-windier path from there. It eventually reveals some answers, but it takes an awfully long time to get there and threatens to lose viewers along the way. Not that those familiar with the franchise will feel surprised by the lack of coherent storytelling, as Evil has always worked overtime to keep viewers unsettled and off-guard. To a degree, I think that’s fine and can be fun, but at some point, it starts to feel like a cheap gimmick. I think Retribution marks that tipping point. It takes nearly one-third of its running time before it finally gets to its “real story”, and even then it’s not especially clear where the movie wants to go. On one hand, it spoonfeeds references to prior films to keep uninitiated viewers with it, but on the other, it throws out so many allusions to those efforts that it seems next to impossible for anyone without past Evil experience to understand the overall narrative. All of this seems like a waste of energy for a franchise that’s really about little more than over the top slow-motion action scenes. Maybe the series’ biggest fans like all the complications and machinations, but I suspect they do more to turn off viewers than to involve them. By this fifth entry, the Evil flicks are in danger of just being more of the same-old, same-old. If there’s anything new or inventive about this one, I can’t find it. I just see more wild action with only the most tangential, tenuous of storylines to keep it together. And that’s just not enough to make the film work, which is a shame. With its various scenarios, Retribution could create a creative take on the zombie genre, but it always comes across as warmed-over Matrix. While the occasional action scene connects, most feel perfunctory and borderline gratuitous, like the filmmakers don’t even want to bother to think up anything new – hey, if it worked in films one through four, it’ll work here! Retribution also comes with the most blatant Aliens rip-off I’ve ever seen. I’ve not examined the disc’s bonus materials yet, so I don’t know if the filmmakers acknowledge it, but there’s no question where they got the sequence; the segment in question couldn’t be more Aliens if it tried. It’s usually a mistake to allude to classic films in the body of a movie because the viewer might make direct comparisons between the two and find the current offering subpar. I didn’t need thoughts of Aliens to view Retribution as a weak movie, but it didn’t help. Maybe fans of the series will find merit here, but I think the franchise is running on fumes. Resident Evil: Retribution appears in an aspect ratio of approximately 2.40:1 on this Blu-Ray Disc. I found no problems here. Sharpness always remained positive. Even the widest shots still showed nice clarity and definition, so don’t expect any issues with softness. At no point did I witness any jagged edges or shimmering. Edge enhancement appeared absent, and no artifacts or DNR showed up along the way. Of course, source flaws weren’t a factor; the movie was clean and fresh. Unlike most modern action films, Retribution avoided a super-stylized palette. Not that it didn’t deliver some tinted overtones, but it remained closer to natural than most in its genre. The hues looked full and rich, without any concerns. Blacks were dark and tight, while low-light shots offered smooth images. I felt consistently pleased with this presentation. I also was happy with the dynamic DTS-HD MA 5.1 soundtrack of Retribution. As with its predecessors, the soundscape used all five speakers on a nearly constant basis. Like I’d expect, the fight scenes – of which we found many – worked the best, as they fleshed out the channels with well-placed and well-integrated material. All of this fused together in a clean manner to create a vivid setting for all the mayhem. Audio quality worked well. Speech seemed concise and crisp, without edginess or other problems. Music came across as bright and peppy, while effects seemed accurate and vibrant. Low-end offered nice enhancement of the mix but didn’t overwhelm. This was a strong soundtrack. Like the four prior Resident Evil releases, Retribution comes with a nice selection of extras. We open with two audio commentaries, the first of which features writer/director Paul WS Anderson and actors Milla Jovovich and Boris Kodjoe. All three sit together for their look at… not much. The actors dominate, so we hardly hear anything from Anderson. Instead, we listen to Jovovich and Kodjoe a) joke around and b) comment on the movie’s action. This makes the track c) really boring. Do we learn anything about the film’s creation? Yeah, a smidgen, but not nearly enough to justify the listening investment. This is a bad commentary that you should skip. For the second commentary, we hear from Paul WS Anderson and producer Jeremy Bolt. They sit together for their discussion of story and characters, the other films in the series, cast and performances, sets and locations, stunts and action, effects, music and other areas. While not a great track, the Anderson/Bolt chat provides a much more engaging affair than its predecessor. Anderson finds his voice again – this time it’s Bolt who doesn’t have much to say – and we get a pretty good overview of the film. There’s too much dead air, but at least we learn real information here. Called Project Alice: The Interactive Database, the next extra lets you learn more about Resident Evil characters. It delivers biographies for many participants and also shows clips from the various films. Nothing special occurs here, but the “Database” becomes a useful way to get background about the characters. Five Deleted and Extended Scenes go for a total of 12 minutes, 35 seconds. These include “Suburban Attack (Extended)” (4:49), “Alice Fights Undead in Corridor of Light - Extended” (2:27), “Undead Rain/Jill in the Control Room” (3:46), “Alice and Ada Find Becky - Extended” (1:13) and “Rain Captures Ada” (0:20). The first two just add more violence/mayhem; they contain no new story info. “Undead” provides character exposition that might’ve been helpful in the final cut, though it also threatens to seem too simple. “Becky” and “Captures” are simple clips without much merit. One fun element: it’s interesting to hear Li Bingbing deliver lines in her real voice; clearly someone else ADRed her dialogue in the final film. A collection of Outtakes lasts four minutes, 36 seconds. Expect the standard assortment of silliness and goof-ups. Seven Featurettes run a total of 49 minutes, 18 seconds. In this area, we discover “Maestro of Evil: Directing Resident Evil: Retribution” (7:32), “Evolving Alice” (6:18), “Resident Evil: Reunion” (9:08), “Design and Build: The World of Resident Evil: Retribution” (8:38), “Drop (Un)Dead: The Creatures of Retribution” (6:24), “Resident Stuntman” (5:43), and “Code: Mika” (5:35). Across these, we hear from Anderson, Jovovich, Kodjoe, Bolt, Bingbing, producer Don Carmody, visual effects supervisor Dennis Berardi, production designed Kevin Phipps, editor Nevin Howie, special makeup effects Paul Jones, stunt/fight coordinator Nick Powell, and actors Michelle Rodriguez, Sienna Guillory, Oded Fehr, Shawn Roberts, Johann Urb, Colin Salmon, Robin Kasyanov, Kevin Durand, and Mika Nakashima. The programs trace what Anderson brings to the franchise, story/character subjects, sets and locations, shooting 3D, effects, stunts and action, production/creature design and makeup. “Maestro”, “Evolving” and “Reunion” all tend to be puffy and superficial, so you won’t miss much if you skip them. Matters improve once we reach “World”, though, as the featurettes’ traipse through technical elements provide a lot of good details. They still feel a bit fluffy, but they offer a fair amount of worthwhile material. Resident Evil: Retribution - Face of the Fan occupies three minutes, 17 seconds. Fan Dylan Syrett – who won a competition to appear in the flick - takes us to the set for a sample day on the shoot and shows us what it’s like to be an extra. This has a few fun moments but lacks much depth. The disc opens with ads for Total Recall (2012), Resident Evil: Damnation, and Looper. Those last two also appear under Previews along with promos for Company of Heroes and Seven Psychopaths. No trailer for Retribution pops up here, but we do get Capcom Game Trailers for Resident Evil 6, Devil May Cry and Dragon’s Dogma. Five films into the franchise and Resident Evil: Retribution shows a series close to creative bankruptcy. With a muddled plot and a reliance on flashy visuals, there’s no meat here, and even the action scenes feel reheated. The Blu-ray delivers excellent picture and audio as well as an erratic but generally solid package of bonus materials. Leave Retribution for die-hard Resident Evil fans.